I don't think there was anyone that didn't love these cookies. And how could you not? 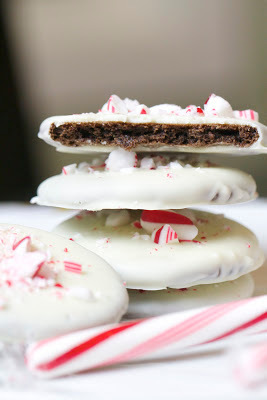 They're perfect for Christmas and I guarantee if you make these for any kind of cookie exchange, you'll be the winner. I've never done a cookie exchange so I don't think there's actually a winner, but you know everyone picks a favorite so someone really does win, right? And you want to be that winner. 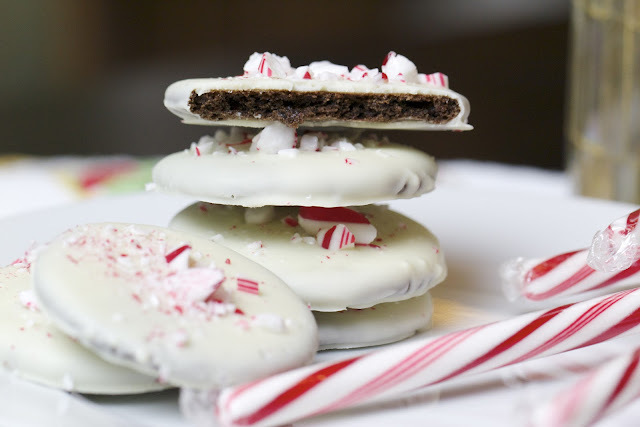 These cookies are made by baking these small chocolate wafers first and then dipping them in white chocolate and then finishing them by sprinkling with crushed peppermint candy. They take a bit longer than other cookies since you have to dip them but it's not overly difficult. Use a good white chocolate (not the chips that are usually not real chocolate) and it should be thin enough to dip without having to add anything else. The dough is very, very sticky so use lots of flour when rolling them out. In a large bowl, sift together the flour, cocoa powder, baking soda, baking powder and salt. In a mixer, beat together the butter and sugar until light and fluffy, about 2 minutes. Beat in the egg, followed by the egg yolk, beating well between each one. Beat in the peppermint extract and then mix in the flour mixture just until combined. Divide dough in half and wrap each portion in plastic wrap. Refrigerate until chilled, about 1 hour. Roll out each disk to about 1/8 inch thick and using a 2 inch circle cutter, cut out the shapes from the dough. Place on a parchment lined cookie sheet and then freeze for 15 minutes. Preheat oven to 325 degrees. Cook the cookies for 12 minutes and remove from oven and let cool. Melt the white chocolate over a double boiler until smooth. Using a fork, dip each cookie in the chocolate, flipping to cover. Let the cookie drip and then scrape the bottom along the edge of the pan. 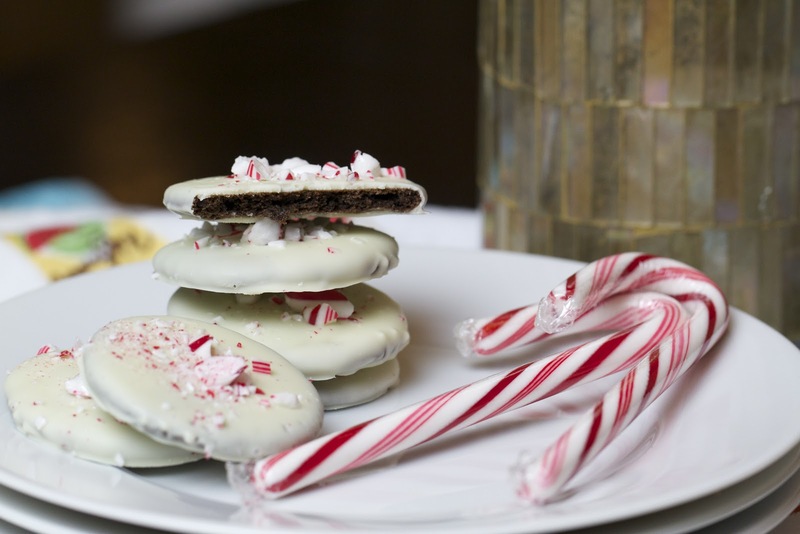 Place the cookie back on the parchment paper and sprinkle with peppermint candy pieces. Repeat with the remaining cookies. 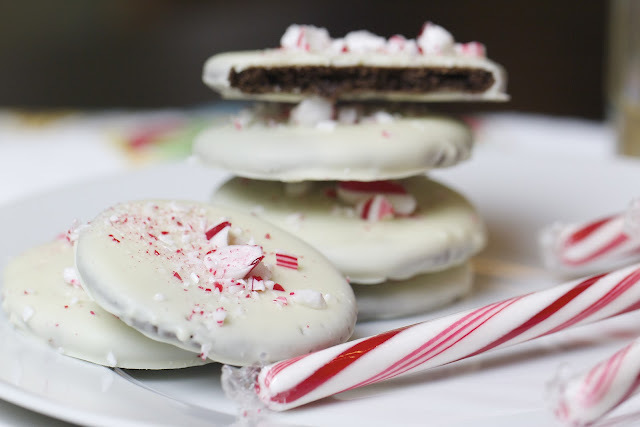 I love peppermint bark, these cookies look delish! Fabulous. Every bite of it! Where were you last week? I saw that they sell a similar cookie at William Sonoma for $23/ dozen (yikes) and decidedto invent my own. So glad you liked them Marla! yum yum, I have to make these this Christmas! Thanks for sharing! I showed your post to my husband. He just went ahead and made me these for our Christmas goodie plates to hand out to friends. I'm seriously going to have to reconsider handing them out, they are that good. I made these this year and there are none left! When I say real white chocolate I'm talking about the ones that have cocoa butter as an ingredient. That's a big difference from the ones that are "vanilla" flavored. I'm just curious... how many cookies does this recipe yield? I have a cookie exchange to bake for and I want to make sure I have enough! Oh my goodness! The timing of this recipe couldn't be anymore perfect. My son's 3rd birthday is this weekend. I will definitely be making these for his birthday breakfast!! Thanks so much! They were awesome! I'm almost always too lazy to roll out anything, but I might have to make an exception for these...yum.